Dop Dop Salon – Come and experience artistry with an edge as you get your locks rocked at Dop Dop Salon. Come and experience artistry with and edge as you get your locks rocked at Dop Dop Salon. Find out where your favorite Dopper is making waves. Why hear about us, when you can see what we are about? ESTABLISHED IN 1996, DOP DOP SALON HAS BECOME A MAINSTAY FOR SOHO ARTISTRY. AS A RENOWNED HAIR SALON AND PERFORMANCE SPACE, ITS 4,000 SQUARE FEET LOFT ATMOSPHERE PROVIDES AN OPEN AND CREATIVE APPROACH TO HAIR ARTISTRY. I knew from a very young age that I wanted to be a hairdresser, and in fact, I entered beauty school at 15. By 17, I had graduated, moved to Houston, Texas and started my career at a salon called Visible Changes. Two ex-New Yorkers, John and Maryanne McCormack, owned the salon, and it was serendipitous that I just happened to walk in one day and got a job. I spent over six years with them learning and experiencing with incredible structure. When I moved to New York, I spent the next six years in unabashed creativity at the John Dellaria Salon. Then in 1996, I opened my own salon in SoHo called Dop Dop Salon. We used ARTec, like we did at both Visible Changes and John Dellaria. I became a platform artist for them and when L’Oréal Professionnel purchased ARTec, they got me and my team. 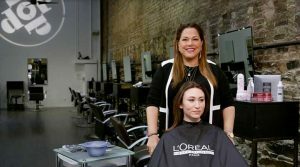 It was a great transition for me to go from ARTec to L’Oréal Professionnel. I always say that God has me where I need to be at every moment, and if I don’t fight it and go with it, I end up where I need to be. So after over six years of incredible structure with the McCormacks, and over six years of unabashed creativity with John Dellaria, I was finally able to marry the two at Dop Dop. I think of what we do as artistry with an edge. We’re extremely creative and extraordinarily tasteful. After 25 years in the industry, both behind the chair and on stage, I have learned that we are all on the same team. We’re one colorist, and we share the same goal – to make our clients look and feel better than they did when they came in. Never forget why we’re really in this business. It isn’t to compete. It isn’t to debase one another. It’s to make a positive difference in people’s lives. FIND OUT WHAT'S HAPPENING AT DOP DOP SALON!